The economy of India is a developing mixed economy. 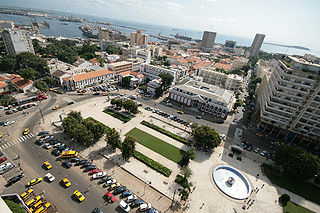 It is the world's seventh-largest economy by nominal GDP and the third-largest by purchasing power parity (PPP). The country ranks 139th in per capita GDP (nominal) with $2,134 and 122nd in per capita GDP (PPP) with $7,783 as of 2018[update]. After the 1991 economic liberalisation, India achieved 6-7% average GDP growth annually. Since 2014 with the exception of 2017, India's economy has been the world's fastest growing major economy, surpassing China. The long-term growth prospective of the Indian economy is positive due to its young population, English proficiency, corresponding low dependency ratio, healthy savings and investment rates, and increasing integration into the global economy. India topped the World Bank's growth outlook for the first time in fiscal year 2015–16, during which the economy grew 7.6%. Despite previous reforms, economic growth is still significantly slowed by bureaucracy, poor infrastructure, and inflexible labor laws (especially the inability to lay off workers in a business slowdown). India has one of the fastest growing service sectors in the world with an annual growth rate above 9% since 2001, which contributed to 57% of GDP in 2012–13. India has become a major exporter of IT services, Business Process Outsourcing (BPO) services, and software services with $154 billion revenue in FY 2017. This is the fastest-growing part of the economy. The IT industry continues to be the largest private-sector employer in India. India is the second-largest start-up hub in the world with over 3,100 technology start-ups in 2018–19. The agricultural sector is the largest employer in India's economy but contributes to a declining share of its GDP (17% in 2013–14). India ranks second worldwide in farm output. The industry (manufacturing) sector has held a steady share of its economic contribution (26% of GDP in 2013–14). The Indian automobile industry is one of the largest in the world with an annual production of 21.48 million vehicles (mostly two and three-wheelers) in 2013–14. India had $600 billion worth of retail market in 2015 and one of world's fastest growing e-commerce markets. The spice trade between India and Europe was the main catalyst for the Age of Discovery. Tharisapalli plates granted to Saint Thomas Christians by South Indian Chera ruler Sthanu Ravi Varma testify that merchant guilds and trade corporations played a very significant role in the economy and social life during the Kulasekhara period of Kerala, India. Atashgah is a temple built by Indian traders before 1745, west of the Caspian Sea. The inscription shown, is a Sanskrit invocation of Lord Shiva. The combination of protectionist, import-substitution, Fabian socialism, and social democratic-inspired policies governed India for sometime after the end of British rule. The economy was then characterised by extensive regulation, protectionism, public ownership of large monopolies, pervasive corruption and slow growth. Since 1991, continuing economic liberalisation has moved the country towards a market-based economy. By 2008, India had established itself as one of the world's faster-growing economies. For a continuous duration of nearly 1700 years from the year 1 AD, India is the top most economy constituting 35 to 40% of world GDP. Maritime trade was carried out extensively between South India and Southeast and West Asia from early times until around the fourteenth century AD. Both the Malabar and Coromandel Coasts were the sites of important trading centres from as early as the first century BC, used for import and export as well as transit points between the Mediterranean region and southeast Asia. Over time, traders organised themselves into associations which received state patronage. Historians Tapan Raychaudhuri and Irfan Habib claim this state patronage for overseas trade came to an end by the thirteenth century AD, when it was largely taken over by the local Parsi, Jewish, Syrian Christian and Muslim communities, initially on the Malabar and subsequently on the Coromandel coast. Other scholars suggest trading from India to West Asia and Eastern Europe was active between the 14th and 18th centuries. During this period, Indian traders settled in Surakhani, a suburb of greater Baku, Azerbaijan. These traders built a Hindu temple, which suggests commerce was active and prosperous for Indians by the 17th century. Further north, the Saurashtra and Bengal coasts played an important role in maritime trade, and the Gangetic plains and the Indus valley housed several centres of river-borne commerce. Most overland trade was carried out via the Khyber Pass connecting the Punjab region with Afghanistan and onward to the Middle East and Central Asia. Although many kingdoms and rulers issued coins, barter was prevalent. Villages paid a portion of their agricultural produce as revenue to the rulers, while their craftsmen received a part of the crops at harvest time for their services. Silver coin of the Maurya Empire, 3rd century BC. Silver coin of the Gupta dynasty, 5th century AD. The Indian economy was large and prosperous under the Mughal Empire, up until the 18th century. Sean Harkin estimates China and India may have accounted for 60 to 70 percent of world GDP in the 17th century. The Mughal economy functioned on an elaborate system of coined currency, land revenue and trade. Gold, silver and copper coins were issued by the royal mints which functioned on the basis of free coinage. The political stability and uniform revenue policy resulting from a centralised administration under the Mughals, coupled with a well-developed internal trade network, ensured that India–before the arrival of the British–was to a large extent economically unified, despite having a traditional agrarian economy characterised by a predominance of subsistence agriculture, with 64% of the workforce in the primary sector (including agriculture), but with 36% of the workforce also in the secondary and tertiary sectors, higher than in Europe, where 65–90% of its workforce were in agriculture in 1700 and 65–75% were in agriculture in 1750. Agricultural production increased under Mughal agrarian reforms, with Indian agriculture being advanced compared to Europe at the time, such as the widespread use of the seed drill among Indian peasants before its adoption in European agriculture, and higher per-capita agricultural output and standards of consumption. The Mughal Empire had a thriving industrial manufacturing economy, with India producing about 25% of the world's industrial output up until 1750, making it the most important manufacturing center in international trade. Manufactured goods and cash crops from the Mughal Empire were sold throughout the world. Key industries included textiles, shipbuilding, and steel, and processed exports included cotton textiles, yarns, thread, silk, jute products, metalware, and foods such as sugar, oils and butter. Cities and towns boomed under the Mughal Empire, which had a relatively high degree of urbanization for its time, with 15% of its population living in urban centres, higher than the percentage of the urban population in contemporary Europe at the time and higher than that of British India in the 19th century. In early modern Europe, there was significant demand for products from Mughal India, particularly cotton textiles, as well as goods such as spices, peppers, indigo, silks, and saltpeter (for use in munitions). European fashion, for example, became increasingly dependent on Mughal Indian textiles and silks. From the late 17th century to the early 18th century, Mughal India accounted for 95% of British imports from Asia, and the Bengal Subah province alone accounted for 40% of Dutch imports from Asia. In contrast, there was very little demand for European goods in Mughal India, which was largely self-sufficient. Indian goods, especially those from Bengal, were also exported in large quantities to other Asian markets, such as Indonesia and Japan. At the time, Mughal Bengal was the most important center of cotton textile production. In the early 18th century, the Mughal Empire declined, as it lost western, central and parts of south and north India to the Maratha Empire, which integrated and continued to administer those regions. The decline of the Mughal Empire led to decreased agricultural productivity, which in turn negatively affected the textile industry. The subcontinent's dominant economic power in the post-Mughal era was the Bengal Subah in the east., which continued to maintain thriving textile industries and relatively high real wages. However, the former was devastated by the Maratha invasions of Bengal and then British colonization in the mid-18th century. After the loss at the Third Battle of Panipat, the Maratha Empire disintegrated into several confederate states, and the resulting political instability and armed conflict severely affected economic life in several parts of the country – although this was mitigated by localised prosperity in the new provincial kingdoms. By the late eighteenth century, the British East India Company had entered the Indian political theatre and established its dominance over other European powers. This marked a determinative shift in India's trade, and a less-powerful impact on the rest of the economy. From the beginning of the 19th century, the British East India Company's gradual expansion and consolidation of power brought a major change in taxation and agricultural policies, which tended to promote commercialisation of agriculture with a focus on trade, resulting in decreased production of food crops, mass impoverishment and destitution of farmers, and in the short term, led to numerous famines. The economic policies of the British Raj caused a severe decline in the handicrafts and handloom sectors, due to reduced demand and dipping employment. After the removal of international restrictions by the Charter of 1813, Indian trade expanded substantially with steady growth. The result was a significant transfer of capital from India to England, which, due to the colonial policies of the British, led to a massive drain of revenue rather than any systematic effort at modernisation of the domestic economy. 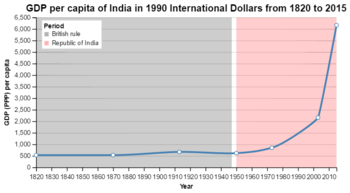 Estimated GDP per capita of India and United Kingdom during 1700–1950 in 1990 US$ according to Maddison. However, Maddison's estimates for 18th-century India have been criticized as gross underestimates, Bairoch estimates India had a higher GDP per capita in the 18th century, and Parthasarathi's findings show higher real wages in 18th-century Bengal and Mysore. But there is consensus that India's per capita GDP and income stagnated during the colonial era, starting in the late 18th century. Under British rule, India's share of the world economy declined from 24.4% in 1700 down to 4.2% in 1950. 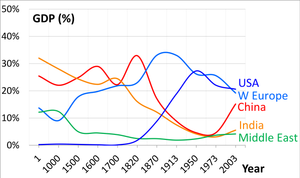 India's GDP (PPP) per capita was stagnant during the Mughal Empire and began to decline prior to the onset of British rule. India's share of global industrial output declined from 25% in 1750 down to 2% in 1900. At the same time, the United Kingdom's share of the world economy rose from 2.9% in 1700 up to 9% in 1870. The British East India Company, following their conquest of Bengal in 1757, had forced open the large Indian market to British goods, which could be sold in India without tariffs or duties, compared to local Indian producers who were heavily taxed, while in Britain protectionist policies such as bans and high tariffs were implemented to restrict Indian textiles from being sold there, whereas raw cotton was imported from India without tariffs to British factories which manufactured textiles from Indian cotton and sold them back to the Indian market. British economic policies gave them a monopoly over India's large market and cotton resources. India served as both a significant supplier of raw goods to British manufacturers and a large captive market for British manufactured goods. British territorial expansion in India throughout the 19th century created an institutional environment that, on paper, guaranteed property rights among the colonisers, encouraged free trade, and created a single currency with fixed exchange rates, standardised weights and measures and capital markets within the company-held territories. It also established a system of railways and telegraphs, a civil service that aimed to be free from political interference, a common-law and an adversarial legal system. This coincided with major changes in the world economy – industrialisation, and significant growth in production and trade. However, at the end of colonial rule, India inherited an economy that was one of the poorest in the developing world, with industrial development stalled, agriculture unable to feed a rapidly growing population, a largely illiterate and unskilled labour force, and extremely inadequate infrastructure. The 1872 census revealed that 91.3% of the population of the region constituting present-day India resided in villages. This was a decline from the earlier Mughal era, when 85% of the population resided in villages and 15% in urban centers under Akbar's reign in 1600. Urbanisation generally remained sluggish in British India until the 1920s, due to the lack of industrialisation and absence of adequate transportation. Subsequently, the policy of discriminating protection (where certain important industries were given financial protection by the state), coupled with the Second World War, saw the development and dispersal of industries, encouraging rural–urban migration, and in particular the large port cities of Bombay, Calcutta and Madras grew rapidly. Despite this, only one-sixth of India's population lived in cities by 1951. The impact of British rule on India's economy is a controversial topic. Leaders of the Indian independence movement and economic historians have blamed colonial rule for the dismal state of India's economy in its aftermath and argued that financial strength required for industrial development in Britain was derived from the wealth taken from India. At the same time, right-wing historians have countered that India's low economic performance was due to various sectors being in a state of growth and decline due to changes brought in by colonialism and a world that was moving towards industrialisation and economic integration. Several economic historians have argued that real wage decline occurred in the early 19th century, or possibly beginning in the very late 18th century, largely as a result of British imperialism. Economic historian Prasannan Parthasarathi presented earnings data which showed real wages and living standards in 18th century Bengal and Mysore being higher than in Britain, which in turn had the highest living standards in Europe. Mysore's average per-capita income was five times higher than subsistence level, i.e. five times higher than $400 (1990 international dollars), or $2,000 per capita. In comparison, the highest national per-capita incomes in 1820 were $1,838 for the Netherlands and $1,706 for Britain. It has also been argued that India went through a period of deindustrialization in the latter half of the 18th century as an indirect outcome of the collapse of the Mughal Empire. Indian economic policy after independence was influenced by the colonial experience, which was seen as exploitative by Indian leaders exposed to British social democracy and the planned economy of the Soviet Union. Domestic policy tended towards protectionism, with a strong emphasis on import substitution industrialisation, economic interventionism, a large government-run public sector, business regulation, and central planning, while trade and foreign investment policies were relatively liberal. Five-Year Plans of India resembled central planning in the Soviet Union. Steel, mining, machine tools, telecommunications, insurance, and power plants, among other industries, were effectively nationalised in the mid-1950s. Change in per capita GDP of India, 1820–2015. Figures are inflation-adjusted to 1990 International Geary-Khamis dollars. Never talk to me about profit, Jeh, it is a dirty word. Jawaharlal Nehru, the first prime minister of India, along with the statistician Prasanta Chandra Mahalanobis, formulated and oversaw economic policy during the initial years of the country's independence. They expected favourable outcomes from their strategy, involving the rapid development of heavy industry by both public and private sectors, and based on direct and indirect state intervention, rather than the more extreme Soviet-style central command system. The policy of concentrating simultaneously on capital- and technology-intensive heavy industry and subsidising manual, low-skill cottage industries was criticised by economist Milton Friedman, who thought it would waste capital and labour, and retard the development of small manufacturers. The rate of growth of the Indian economy in the first three decades after independence was derisively referred to as the Hindu rate of growth by economists, because of the unfavourable comparison with growth rates in other Asian countries. I cannot decide how much to borrow, what shares to issue, at what price, what wages and bonus to pay, and what dividend to give. I even need the government's permission for the salary I pay to a senior executive. Since 1965, the use of high-yielding varieties of seeds, increased fertilisers and improved irrigation facilities collectively contributed to the Green Revolution in India, which improved the condition of agriculture by increasing crop productivity, improving crop patterns and strengthening forward and backward linkages between agriculture and industry. However, it has also been criticised as an unsustainable effort, resulting in the growth of capitalistic farming, ignoring institutional reforms and widening income disparities. Subsequently, the Emergency and Garibi Hatao concept under which income tax levels at one point rose to a maximum of 97.5% – a world record for non-communist economies – started diluting the earlier efforts. In the late 1970s, the government led by Morarji Desai eased restrictions on capacity expansion for incumbent companies, removed price controls, reduced corporate taxes and promoted the creation of small-scale industries in large numbers. Economic liberalisation in India was initiated in 1991 by Prime Minister P. V. Narasimha Rao and his then-Finance Minister Dr. Manmohan Singh. Rao was often referred to as Chanakya for his ability to steer tough economic and political legislation through the parliament at a time when he headed a minority government. The collapse of the Soviet Union, which was India's major trading partner, and the Gulf War, which caused a spike in oil prices, resulted in a major balance-of-payments crisis for India, which found itself facing the prospect of defaulting on its loans. India asked for a $1.8 billion bailout loan from the International Monetary Fund (IMF), which in return demanded de-regulation. In response, the Narasimha Rao government, including Finance Minister Manmohan Singh, initiated economic reforms in 1991. The reforms did away with the Licence Raj, reduced tariffs and interest rates and ended many public monopolies, allowing automatic approval of foreign direct investment in many sectors. Since then, the overall thrust of liberalisation has remained the same, although no government has tried to take on powerful lobbies such as trade unions and farmers, on contentious issues such as reforming labour laws and reducing agricultural subsidies. By the turn of the 21st century, India had progressed towards a free-market economy, with a substantial reduction in state control of the economy and increased financial liberalisation. This has been accompanied by increases in life expectancy, literacy rates, and food security, although urban residents have benefited more than rural residents. GDP grows exponentially, almost doubling every five years. Indian GDP growth rate from 1985 to 2016 in red, compared to that of China in green. Starting in 2012,[clarification needed] India entered a period of reduced growth, which slowed to 5.6%. Other economic problems also became apparent: a plunging Indian rupee, a persistent high current account deficit and slow industrial growth. Hit by the US Federal Reserve's decision to taper quantitative easing, foreign investors began rapidly pulling money out of India – though this reversed with the stock market approaching its all-time high and the current account deficit narrowing substantially. India started recovery in 2013–14 when the GDP growth rate accelerated to 6.4% from the previous year's 5.5%. The acceleration continued through 2014–15 and 2015–16 with growth rates of 7.5% and 8.0% respectively. For the first time since 1990, India grew faster than China which registered 6.9% growth in 2015. [needs update] However the growth rate subsequently decelerated, to 7.1% and 6.6% in 2016–17 and 2017–18 respectively, partly because of the disruptive effects of 2016 Indian banknote demonetisation and the Goods and Services Tax (India). As of October 2018[update], India is the world's fastest growing economy, and is expected to maintain that status for at least three more years. India is ranked 77th out of 190 countries in the World Bank's 2018 ease of doing business index, up 23 points from the last year's 100 and up 53 points in just two years. In terms of dealing with construction permits and enforcing contracts, it is ranked among the 10 worst in the world, while it has a relatively favourable ranking when it comes to protecting minority investors or getting credit. The strong efforts taken by the Department of Industrial Policy and Promotion (DIPP) to boost ease of doing business rankings at the state level is said to impact the overall rankings of India. The following table shows the main economic indicators in 1980–2018. Inflation under 5% is in green. Percent labour employment in India by economic sectors (2010). Contribution to GDP of India by economic sectors of Indian economy have evolved between 1951 and 2013, as its economy has diversified and developed. Historically, India has classified and tracked its economy and GDP in three sectors: agriculture, industry and services. Agriculture includes crops, horticulture, milk and animal husbandry, aquaculture, fishing, sericulture, aviculture, forestry and related activities. 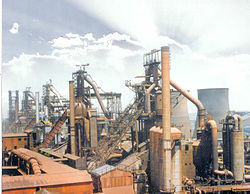 Industry includes various manufacturing sub-sectors. India's definition of services sector includes its construction, retail, software, IT, communications, hospitality, infrastructure operations, education, healthcare, banking and insurance, and many other economic activities. India ranks second worldwide in farm output. Agriculture and allied sectors like forestry, logging and fishing accounted for 17% of the GDP.The sector employed 49% of its total workforce in 2014. Agriculture accounted for 23% of GDP, and employed 59% of the country's total workforce in 2016. As the Indian economy has diversified and grown, agriculture's contribution to GDP has steadily declined from 1951 to 2011, yet it is still the country's largest employment source and a significant piece of its overall socio-economic development. Crop-yield-per-unit-area of all crops has grown since 1950, due to the special emphasis placed on agriculture in the five-year plans and steady improvements in irrigation, technology, application of modern agricultural practices and provision of agricultural credit and subsidies since the Green Revolution in India. However, international comparisons reveal the average yield in India is generally 30% to 50% of the highest average yield in the world. The states of Uttar Pradesh, Punjab, Haryana, Madhya Pradesh, Andhra Pradesh, Telangana, Bihar, West Bengal, Gujarat and Maharashtra are key contributors to Indian agriculture. The state of Punjab led India's Green Revolution and earned the distinction of being the country's bread basket. Amul Dairy Plant at Anand, Gujarat, was a highly successful co-operative started during Operation Flood in the 1970s. India receives an average annual rainfall of 1,208 millimetres (47.6 in) and a total annual precipitation of 4000 billion cubic metres, with the total utilisable water resources, including surface and groundwater, amounting to 1123 billion cubic metres. 546,820 square kilometres (211,130 sq mi) of the land area, or about 39% of the total cultivated area, is irrigated. India's inland water resources and marine resources provide employment to nearly six million people in the fisheries sector. In 2010, India had the world's sixth-largest fishing industry. India exports more than 100,000 tonnes of processed cashew kernels every year. There are more than 600 cashew processing units in Kollam alone. India is the largest producer of milk, jute and pulses, and has the world's second-largest cattle population with 170 million animals in 2011. It is the second-largest producer of rice, wheat, sugarcane, cotton and groundnuts, as well as the second-largest fruit and vegetable producer, accounting for 10.9% and 8.6% of the world fruit and vegetable production, respectively. India is also the second-largest producer and the largest consumer of silk, producing 77,000 tons in 2005. India is the largest exporter of cashew kernels and cashew nut shell liquid (CNSL). Foreign exchange earned by the country through the export of cashew kernels during 2011–12 reached ₹4,390 crore (₹ 43.9 billion) based on statistics from the Cashew Export Promotion Council of India (CEPCI). 131,000 tonnes of kernels were exported during 2011–12. 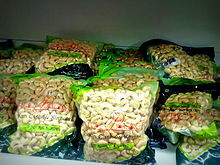 There are about 600 cashew processing units in Kollam, Kerala. India's foodgrain production remained stagnant at approximately 252 million tonnes (MT) during both the 2015–16 and 2014–15 crop years (July–June). India exports several agriculture products, such as Basmati rice, wheat, cereals, spices, fresh fruits, dry fruits, buffalo beef meat, cotton, tea, coffee and other cash crops particularly to the Middle East, Southeast and East Asian countries. About 10 percent of its export earnings come from this trade. Indian agriculture is diverse, ranging from impoverished farm villages to developed farms using modern agricultural technologies. This image shows a farming community in a more prosperous part of India. At around 1,530,000 square kilometres (590,000 sq mi), India has the second-largest amount of arable land, after the US, with 52% of total land under cultivation. Although the total land area of the country is only slightly more than one-third of China or the US, India's arable land is marginally smaller than that of the US, and marginally larger than that of China. However, agricultural output lags far behind its potential. The low productivity in India is a result of several factors. According to the World Bank, India's large agricultural subsidies are distorting what farmers grow and hampering productivity-enhancing investment. Over-regulation of agriculture has increased costs, price risks and uncertainty, and governmental intervention in labour, land, and credit are hurting the market. Infrastructure such as rural roads, electricity, ports, food storage, retail markets and services remain inadequate. The average size of land holdings is very small, with 70% of holdings being less than one hectare (2.5 acres) in size. Irrigation facilities are inadequate, as revealed by the fact that only 46% of the total cultivable land was irrigated as of 2016,[update] resulting in farmers still being dependent on rainfall, specifically the monsoon season, which is often inconsistent and unevenly distributed across the country. In an effort to bring an additional two crore hectares (20 million hectares; 50 million acres) of land under irrigation, various schemes have been attempted, including the Accelerated Irrigation Benefit Programme (AIBP) which was provided ₹80,000 crore (₹800 billion) in the union budget. Farming incomes are also hampered by lack of food storage and distribution infrastructure; a third of India's agricultural production is lost from spoilage. Industry accounts for 26% of GDP and employs 22% of the total workforce. According to the World Bank, India's industrial manufacturing GDP output in 2015 was 6th largest in the world on current US dollar basis ($559 billion), and 9th largest on inflation-adjusted constant 2005 US dollar basis ($197.1 billion). The industrial sector underwent significant changes due to the 1991 economic reforms, which removed import restrictions, brought in foreign competition, led to the privatisation of certain government-owned public-sector industries, liberalised the foreign direct investment (FDI) regime, improved infrastructure and led to an expansion in the production of fast-moving consumer goods. Post-liberalisation, the Indian private sector was faced with increasing domestic and foreign competition, including the threat of cheaper Chinese imports. It has since handled the change by squeezing costs, revamping management, and relying on cheap labour and new technology. However, this has also reduced employment generation, even among smaller manufacturers who previously relied on labour-intensive processes. Nuclear capable Agni-II ballistic missile. 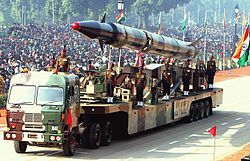 Since May 1998, India declared itself to be a full-fledged nuclear state. With strength of over 1.3 million active personnel, India has the third-largest military force and the largest volunteer army. The total budget sanctioned for the Indian military for the financial year 2017 was (US$53.5 billion). Defence spending is expected to rise to US$62 billion by 2022. Primary energy consumption of India is the third-largest after China and the US with 5.3% global share in the year 2015. Coal and crude oil together account for 85% of the primary energy consumption of India. India's oil reserves meet 25% of the country's domestic oil demand. As of April 2015,[update] India's total proven crude oil reserves are 763.476 million metric tons, while gas reserves stood at 1,490 billion cubic metres (53 trillion cubic feet). Oil and natural gas fields are located offshore at Bombay High, Krishna Godavari Basin and the Cauvery Delta, and onshore mainly in the states of Assam, Gujarat and Rajasthan. India is the fourth-largest consumer of oil and net oil imports were nearly ₹820,000 crore (US$110 billion) in 2014–15, which had an adverse effect on the country's current account deficit. The petroleum industry in India mostly consists of public sector companies such as Oil and Natural Gas Corporation (ONGC), Hindustan Petroleum Corporation Limited (HPCL), Bharat Petroleum Corporation Limited (BPCL) and Indian Oil Corporation Limited (IOCL). There are some major private Indian companies in the oil sector such as Reliance Industries Limited (RIL) which operates the world's largest oil refining complex. India became the world's third-largest producer of electricity in 2013 with a 4.8% global share in electricity generation, surpassing Japan and Russia. By the end of calendar year 2015, India had an electricity surplus with many power stations idling for want of demand. The utility electricity sector had an installed capacity of 303 GW as of May 2016[update] of which thermal power contributed 69.8%, hydroelectricity 15.2%, other sources of renewable energy 13.0%, and nuclear power 2.1%. India meets most of its domestic electricity demand through its 106 billion tonnes of proven coal reserves. India is also rich in certain alternative sources of energy with significant future potential such as solar, wind and biofuels (jatropha, sugarcane). India's dwindling uranium reserves stagnated the growth of nuclear energy in the country for many years. Recent discoveries in the Tummalapalle belt may be among the top 20 natural uranium reserves worldwide,[needs update] and an estimated reserve of 846,477 metric tons (933,081 short tons) of thorium – about 25% of world's reserves – are expected to fuel the country's ambitious nuclear energy program in the long-run. The Indo-US nuclear deal has also paved the way for India to import uranium from other countries. The engineering industry of India includes its growing car, motorcycle and scooters industry, and productivity machinery such as tractors. India manufactured and assembled about 18 million passenger and utility vehicles in 2011, of which 2.3 million were exported. India is the largest producer and the largest market for tractors, accounting for 29% of global tractor production in 2013. India is the 12th-largest producer and 7th-largest consumer of machine tools. The automotive manufacturing industry contributed $79 billion (4% of GDP) and employed 6.76 million people (2% of the workforce) in 2016. Many famous stones such as the Koh-i-noor and Hope Diamond (above), came from India. India is one of the largest centres for polishing diamonds and gems and manufacturing jewellery; it is also one of the two largest consumers of gold. After crude oil and petroleum products, the export and import of gold, precious metals, precious stones, gems and jewellery accounts for the largest portion of India's global trade. The industry contributes about 7% of India's GDP, employs millions, and is a major source of its foreign-exchange earnings. The gems and jewellery industry created $60 billion in economic output on value-added basis in 2017, and is projected to grow to $110 billion by 2022. The gems and jewellery industry has been economically active in India for several thousand years. Until the 18th century, India was the only major reliable source of diamonds. Now, South Africa and Australia are the major sources of diamonds and precious metals, but along with Antwerp, New York, and Ramat Gan, Indian cities such as Surat and Mumbai are the hubs of world's jewellery polishing, cutting, precision finishing, supply and trade. Unlike other centres, the gems and jewellery industry in India is primarily artisan-driven; the sector is manual, highly fragmented, and almost entirely served by family-owned operations. The particular strength of this sub-sector is in precision cutting, polishing and processing small diamonds (below one carat). India is also a hub for processing of larger diamonds, pearls and other precious stones. Statistically, 11 out of 12 diamonds set in any jewellery in the world are cut and polished in India. It is also a major hub of gold and other precious-metal-based jewellery. Domestic demand for gold and jewellery products is another driver of India's GDP. 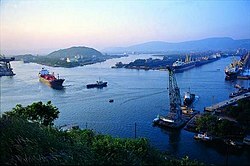 Visakhapatnam Port in the Bay of Bengal. India's infrastructure and transport sector contributes about 5% of its GDP. India has a road network of over 5,472,144 kilometres (3,400,233 mi) as of 31 March 2015,[update] the third-largest road network in the world behind United States and China. At 1.66 km of roads per square kilometre of land (2.68 miles per square mile), the quantitative density of India's road network is higher than that of Japan (0.91) and the United States (0.67), and far higher than that of China (0.46), Brazil (0.18) or Russia (0.08). Qualitatively, India's roads are a mix of modern highways and narrow, unpaved roads, and are being improved. As of 31 March 2015,[update] 61.05% of Indian roads were paved. India has the lowest kilometre-lane road density per 100,000 people among G-27 countries, leading to traffic congestion. It is upgrading its infrastructure. As of May 2014,[update] India had completed over 22,600 kilometres (14,000 mi) of 4- or 6-lane highways, connecting most of its major manufacturing, commercial and cultural centres. India's road infrastructure carries 60% of freight and 87% of passenger traffic. Petroleum products and chemicals are a major contributor to India's industrial GDP, and together they contribute over 34% of its export earnings. India hosts many oil refinery and petrochemical operations, including the world's largest refinery complex in Jamnagar that processes 1.24 million barrels of crude per day. By volume, the Indian chemical industry was the third-largest producer in Asia, and contributed 5% of the country's GDP. India is one of the five-largest producers of agrochemicals, polymers and plastics, dyes and various organic and inorganic chemicals. Despite being a large producer and exporter, India is a net importer of chemicals due to domestic demands. The chemicals manufacturing industry contributed $141 billion (6% of GDP) and employed 17.33 million people (4% of the workforce) in 2016. The Indian pharmaceutical industry has grown in recent years to become a major manufacturer of health care products to the world. India produced about 8% of the global pharmaceutical supply in 2011 by value, including over 60,000 generic brands of medicines. The industry grew from $6 billion in 2005 to $36.7 billion in 2016, a compound annual growth rate (CAGR) of 17.46%. It is expected to grow at a CAGR of 15.92% to reach $55 billion in 2020. India is expected to become the sixth-largest pharmaceutical market in the world by 2020. It is one of the fastest-growing industrial sub-sectors and a significant contributor of India's export earnings. The state of Gujarat has become a hub for the manufacture and export of pharmaceuticals and active pharmaceutical ingredients (APIs). The textile and apparel market in India was estimated to be $108.5 billion in 2015. It is expected to reach a size of $226 billion by 2023. The industry employees over 35 million people. By value, the textile industry accounts for 7% of India's industrial, 2% of GDP and 15% of the country's export earnings. India exported $ 39.2 billion worth of textiles in the 2017-18 fiscal year. India's textile industry has transformed in recent years from a declining sector to a rapidly developing one. After freeing the industry in 2004–2005 from a number of limitations, primarily financial, the government permitted massive investment inflows, both domestic and foreign. From 2004 to 2008, total investment into the textile sector increased by 27 billion dollars. Ludhiana produces 90% of woollens in India and is known as the Manchester of India. Tirupur has gained universal recognition as the leading source of hosiery, knitted garments, casual wear and sportswear. Expanding textile centres such as Ichalkaranji enjoy one of the highest per-capita incomes in the country. India's cotton farms, fibre and textile industry provides employment to 45 million people in India, including some child labour (1%). The sector is estimated to employ around 400,000 children under the age of 18. The pulp and paper industry in India is one of the major producers of paper in the world and has adopted new manufacturing technology. The paper market in India was estimated to be worth ₹60,000 crore (US$8.3 billion) in 2017-18 recording a CAGR of 6-7%. Domestic demand for paper almost doubled from around 9 million tonnes in the 2007-08 fiscal to over 17 million tonnes in 2017-18. The per capita consumption of paper in India is around 13-14 kg annually, lower than the global average of 57 kg. Hyderabad is a major IT services centre. Air India became the first Asian carrier to induct a jet aircraft, with the Boeing 707–420 Gauri Shankar. India is the fourth-largest civil aviation market in the world recording an air traffic of 158 million passengers in 2017. The market is estimated to have 800 aircraft by 2020, which would account for 4.3% of global volumes, and is expected to record annual passenger traffic of 520 million by 2037. IATA estimated that aviation contributed $30 billion to India's GDP in 2017, and supported 7.5 million jobs - 390,000 directly, 570,000 in the value chain, and 6.2 million through tourism. Civil aviation in India traces its beginnings to 18 February 1911, when Henri Pequet, a French aviator, carried 6,500 pieces of mail on a Humber biplane from Allahabad to Naini. Later on 15 October 1932, J.R.D. Tata flew a consignment of mail from Karachi to Juhu Airport. His airline later became Air India and was the first Asian airline to cross the Atlantic Ocean as well as first Asian airline to fly jets. In March 1953, the Indian Parliament passed the Air Corporations Act to streamline and nationalise the then existing privately owned eight domestic airlines into Indian Airlines for domestic services and the Tata group-owned Air India for international services. The International Airports Authority of India (IAAI) was constituted in 1972 while the National Airports Authority was constituted in 1986. The Bureau of Civil Aviation Security was established in 1987 following the crash of Air India Flight 182. The government de-regularised the civil aviation sector in 1991 when the government allowed private airlines to operate charter and non-scheduled services under the 'Air Taxi' Scheme until 1994, when the Air Corporation Act was repealed and private airlines could now operate scheduled services. Private airlines including Jet Airways, Air Sahara, Modiluft, Damania Airways and NEPC Airlines commenced domestic operations during this period. The aviation industry experienced a rapid transformation following deregulation. Several low-cost carriers entered the Indian market in 2004–05. Major new entrants included Air Deccan, Air Sahara, Kingfisher Airlines, SpiceJet, GoAir, Paramount Airways and IndiGo. Kingfisher Airlines became the first Indian air carrier on 15 June 2005 to order Airbus A380 aircraft worth US$3 billion. However, Indian aviation would struggle due to an economic slowdown and rising fuel and operation costs. This led to consolidation, buyouts and discontinuations. In 2007, Air Sahara and Air Deccan were acquired by Jet Airways and Kingfisher Airlines respectively. Paramount Airways ceased operations in 2010 and Kingfisher shut down in 2012. Etihad Airways agreed to acquire a 24% stake in Jet Airways in 2013. AirAsia India, a low-cost carrier operating as a joint venture between Air Asia and Tata Sons launched in 2014. As of 2013[update]–14, only IndiGo and GoAir were generating profits. [needs update] The average domestic passenger air fare dropped by 70% between 2005 and 2017, after adjusting for inflation. State Bank of India is the largest bank in India. The financial services industry contributed $809 billion (37% of GDP) and employed 14.17 million people (3% of the workforce) in 2016, and the banking sector contributed $407 billion (19% of GDP) and employed 5.5 million people (1% of the workforce) in 2016. The Indian money market is classified into the organised sector, comprising private, public and foreign-owned commercial banks and cooperative banks, together known as 'scheduled banks'; and the unorganised sector, which includes individual or family-owned indigenous bankers or money lenders and non-banking financial companies. The unorganised sector and microcredit are preferred over traditional banks in rural and sub-urban areas, especially for non-productive purposes such as short-term loans for ceremonies. Prime Minister Indira Gandhi nationalised 14 banks in 1969, followed by six others in 1980, and made it mandatory for banks to provide 40% of their net credit to priority sectors including agriculture, small-scale industry, retail trade and small business, to ensure that the banks fulfilled their social and developmental goals. Since then, the number of bank branches has increased from 8,260 in 1969 to 72,170 in 2007 and the population covered by a branch decreased from 63,800 to 15,000 during the same period. The total bank deposits increased from ₹59.1 billion (US$820 million) in 1970–71 to ₹38,309.22 billion (US$530 billion) in 2008–09. Despite an increase of rural branches – from 1,860 or 22% of the total in 1969 to 30,590 or 42% in 2007 – only 32,270 of 500,000 villages are served by a scheduled bank. India's gross domestic savings in 2006–07 as a percentage of GDP stood at a high 32.8%. More than half of personal savings are invested in physical assets such as land, houses, cattle, and gold. The government-owned public-sector banks hold over 75% of total assets of the banking industry, with the private and foreign banks holding 18.2% and 6.5% respectively. Since liberalisation, the government has approved significant banking reforms. While some of these relate to nationalised banks – such as reforms encouraging mergers, reducing government interference and increasing profitability and competitiveness – other reforms have opened the banking and insurance sectors to private and foreign companies. According to the report of The National Association of Software and Services Companies (NASSCOM), India has a presence of around 400 companies in the fintech space, with an investment of about $420 million in 2015. The NASSCOM report also estimated the fintech software and services market to grow 1.7 times by 2020, making it worth $8 billion. The Indian fintech landscape is segmented as follows – 34% in payment processing, followed by 32% in banking and 12% in the trading, public and private markets. Infosys Media Centre in Bangalore, India. 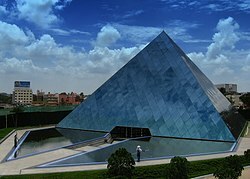 Infosys is one of the largest Indian IT companies. 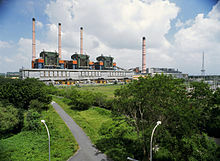 Tidel Park, the then largest IT park in Asia when it was opened in 2000. The information technology (IT) industry in India consists of two major components: IT services and business process outsourcing (BPO). The sector has increased its contribution to India's GDP from 1.2% in 1998 to 7.5% in 2012. According to NASSCOM, the sector aggregated revenues of US$147 billion in 2015, where export revenue stood at US$99 billion and domestic at US$48 billion, growing by over 13%. The growth in the IT sector is attributed to increased specialisation, and an availability of a large pool of low-cost, highly skilled, fluent English-speaking workers – matched by increased demand from foreign consumers interested in India's service exports, or looking to outsource their operations. The share of the Indian IT industry in the country's GDP increased from 4.8% in 2005–06 to 7% in 2008. In 2009, seven Indian firms were listed among the top 15 technology outsourcing companies in the world. The business process outsourcing services in the outsourcing industry in India caters mainly to Western operations of multinational corporations. As of 2012,[update] around 2.8 million people work in the outsourcing sector. Annual revenues are around $11 billion, around 1% of GDP. Around 2.5 million people graduate in India every year. Wages are rising by 10–15 percent as a result of skill shortages. India became the tenth-largest insurance market in the world in 2013, rising from 15th in 2011. At a total market size of US$66.4 billion in 2013, it remains small compared to world's major economies, and the Indian insurance market accounted for just 2% of the world's insurance business in 2017. India's life and non-life insurance industry collected ₹6.10 lakh crore (US$85 billion) in total gross insurance premiums in 2018. Life insurance accounts for 75.41% of the insurance market and the rest is general insurance. Of the 52 insurance companies in India, 24 are active in life-insurance business. The industry reported a growth rate of around 10% from 1996–97 to 2000–01. After opening the sector, growth rates averaged 15.85% from 2001–02 to 2010–11. Specialised insurers Export Credit Guarantee Corporation and Agriculture Insurance Company (AIC) offer credit guarantee and crop insurance, respectively. AIC, which initially offered coverage under the National Agriculture Insurance Company (NAIS), has now started providing crop insurance on commercial line as well. It has introduced several innovative products such as weather insurance and insurance related to specific crops. The premium underwritten by the non-life insurers during 2010–11 was ₹42,576 crore (₹425 billion) against ₹34,620 crore (₹346 billion) in 2009–10. The growth was satisfactory,[according to whom?] particularly given across-the-broad cuts in the tariff rates. The private insurers underwrote premiums of ₹17,424 crore (₹174 billion) against ₹13,977 crore (₹140 billion) in 2009–10. Public sector insurers underwrote premiums of ₹25,151.8 crore (₹252 billion) in 2010–11 against ₹20,643.5 crore (₹206 billion) in 2009–10, a growth of 21.8% against 14.5% in 2009–10. The Indian insurance business had been under-developed with low levels of insurance penetration. Post liberalisation, the sector has succeeded in raising penetration from 2.3 (life 1.8 and non-life 0.7) in 2000 to 5.1 (life 4.4 and non-life 0.7) in 2010. Neighbourhood grocery shops handle much of retail trade in India. The retail industry, excluding wholesale, contributed $482 billion (22% of GDP) and employed 249.94 million people (57% of the workforce) in 2016. The industry is the second largest employer in India, after agriculture. The Indian retail market is estimated to be US$600 billion and one of the top-five retail markets in the world by economic value. India has one of the fastest-growing retail markets in the world, and is projected to reach $1.3 trillion by 2020. The e-commerce retail market in India was valued at $32.7 billion in 2018, and is expected to reach $71.9 billion by 2022. India's retail industry mostly consists of local mom-and-pop stores, owner-manned shops and street vendors. Retail supermarkets are expanding, with a market share of 4% in 2008. In 2012, the government permitted 51% FDI in multi-brand retail and 100% FDI in single-brand retail. However, a lack of back-end warehouse infrastructure and state-level permits and red tape continue to limit growth of organised retail. Compliance with over thirty regulations such as "signboard licences" and "anti-hoarding measures" must be made before a store can open for business. There are taxes for moving goods from state to state, and even within states. According to The Wall Street Journal, the lack of infrastructure and efficient retail networks cause a third of India's agriculture produce to be lost from spoilage. Kerala became a major tourist destination after the state government promoted its natural coastline. Bactrian camel ride at Nubra Valley in Ladakh. The World Travel & Tourism Council calculated that tourism generated ₹15.24 lakh crore (US$210 billion) or 9.4% of the nation's GDP in 2017 and supported 41.622 million jobs, 8% of its total employment. The sector is predicted to grow at an annual rate of 6.9% to ₹32.05 lakh crore (US$450 billion) by 2028 (9.9% of GDP). Over 10 million foreign tourists arrived in India in 2017 compared to 8.89 million in 2016, recording a growth of 15.6%. India earned $21.07 billion in foreign exchange from tourism receipts in 2015. International tourism to India has seen a steady growth from 2.37 million arrivals in 1997 to 8.03 million arrivals in 2015. The United States is the largest source of international tourists to India, while European Union nations and Japan are other major sources of international tourists. Less than 10% of international tourists visit the Taj Mahal, with the majority visiting other cultural, thematic and holiday circuits. Over 12 million Indian citizens take international trips each year for tourism, while domestic tourism within India adds about 740 million Indian travellers. An ASSOCHAM-PwC joint study projected that the Indian media and entertainment industry would grow from a size of $30.364 billion in 2017 to $52.683 billion by 2022, recording a CAGR of 11.7%. The study also predicted that television, cinema and over-the-top services would account for nearly half of the overall industry growth during the period. India's healthcare sector is expected to grow at a CAGR of 29% between 2015 and 2020, to reach US$280 billion, buoyed by rising incomes, greater health awareness, increased precedence of lifestyle diseases, and improved access to health insurance. The ayurveda industry in India recorded a market size of $4.4 billion in 2018. The Confederation of Indian Industry estimates that the industry will grow at a CAGR 16% until 2025. Nearly 75% of the market comprises over-the-counter personal care and beauty products, while ayurvedic well-being or ayurvedic tourism services accounted for 15% of the market. The logistics industry in India was worth over $160 billion in 2016, and grew at a CAGR of 7.8% in the previous five-year period. The industry employs about 22 million people. It is expected to reach of a size of $215 billion by 2020. India was ranked 35th out of 160 countries in the World Bank's 2016 Logistics Performance Index. The telecommunication sector generated ₹2.20 lakh crore (US$31 billion) in revenue in 2014–15, accounting for 1.94% of total GDP. India is the second-largest market in the world by number of telephone users (both fixed and mobile phones) with 1.053 billion subscribers as of 31 August 2016. [update] It has one of the lowest call-tariffs in the world, due to fierce competition among telecom operators. India has the world's third-largest Internet user-base. As of 31 March 2016,[update] there were 342.65 million Internet subscribers in the country. Industry estimates indicate that there are over 554 million TV consumers in India as of 2012. [update] India is the largest direct-to-home (DTH) television market in the world by number of subscribers. As of May 2016,[update] there were 84.80 million DTH subscribers in the country. Indian coal production is the 3rd highest in the world according to the 2008 Indian Ministry of Mines estimates. Shown above is a coal mine in Jharkhand. Mining contributed $63 billion (3% of GDP) and employed 20.14 million people (5% of the workforce) in 2016. India's mining industry was the fourth-largest producer of minerals in the world by volume, and eighth-largest producer by value in 2009. In 2013, it mined and processed 89 minerals, of which four were fuel, three were atomic energy minerals, and 80 non-fuel. The government-owned public sector accounted for 68% of mineral production by volume in 2011–12. Nearly 50% of India's mining industry, by output value, is concentrated in eight states: Odisha, Rajasthan, Chhattisgarh, Andhra Pradesh, Telangana, Jharkhand, Madhya Pradesh and Karnataka. Another 25% of the output by value comes from offshore oil and gas resources. India operated about 3,000 mines in 2010, half of which were coal, limestone and iron ore. On output-value basis, India was one of the five largest producers of mica, chromite, coal, lignite, iron ore, bauxite, barite, zinc and manganese; while being one of the ten largest global producers of many other minerals. India was the fourth-largest producer of steel in 2013, and the seventh-largest producer of aluminium. In fiscal year 2014–15, India was the third-largest producer of raw steel and the largest producer of sponge iron. The industry produced 91.46 million tons of finished steel and 9.7 million tons of pig iron. Most iron and steel in India is produced from iron ore. The construction industry contributed $288 billion (13% of GDP) and employed 60.42 million people (14% of the workforce) in 2016. A map showing the global distribution of Indian exports in 2006 as a percentage of the top market (US at $20.9 billion). 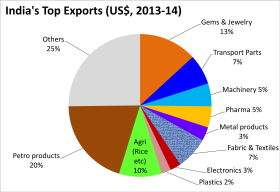 India's exports (top) and imports (bottom), by value, in 2013–14. Until the liberalisation of 1991, India was largely and intentionally isolated from world markets, to protect its economy and to achieve self-reliance. Foreign trade was subject to import tariffs, export taxes and quantitative restrictions, while foreign direct investment (FDI) was restricted by upper-limit equity participation, restrictions on technology transfer, export obligations and government approvals; these approvals were needed for nearly 60% of new FDI in the industrial sector. The restrictions ensured that FDI averaged only around $200 million annually between 1985 and 1991; a large percentage of the capital flows consisted of foreign aid, commercial borrowing and deposits of non-resident Indians. India's exports were stagnant for the first 15 years after independence, due to general neglect of trade policy by the government of that period; imports in the same period, with early industrialisation, consisted predominantly of machinery, raw materials and consumer goods. Since liberalisation, the value of India's international trade has increased sharply, with the contribution of total trade in goods and services to the GDP rising from 16% in 1990–91 to 47% in 2009–10. Foreign trade accounted for 48.8% of India's GDP in 2015. Globally, India accounts for 1.44% of exports and 2.12% of imports for merchandise trade and 3.34% of exports and 3.31% of imports for commercial services trade. India's major trading partners are the European Union, China, the United States and the United Arab Emirates. In 2006–07, major export commodities included engineering goods, petroleum products, chemicals and pharmaceuticals, gems and jewellery, textiles and garments, agricultural products, iron ore and other minerals. 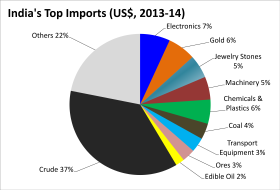 Major import commodities included crude oil and related products, machinery, electronic goods, gold and silver. In November 2010, exports increased 22.3% year-on-year to ₹850.63 billion (US$12 billion), while imports were up 7.5% at ₹1,251.33 billion (US$17 billion). The trade deficit for the same month dropped from ₹468.65 billion (US$6.5 billion) in 2009 to ₹400.7 billion (US$5.6 billion) in 2010. Since independence, India's balance of payments on its current account has been negative. Since economic liberalisation in the 1990s, precipitated by a balance-of-payment crisis, India's exports rose consistently, covering 80.3% of its imports in 2002–03, up from 66.2% in 1990–91. However, the global economic slump followed by a general deceleration in world trade saw the exports as a percentage of imports drop to 61.4% in 2008–09. India's growing oil import bill is seen as the main driver behind the large current account deficit, which rose to $118.7 billion, or 11.11% of GDP, in 2008–09. Between January and October 2010, India imported $82.1 billion worth of crude oil. The Indian economy has run a trade deficit every year from 2002 to 2012, with a merchandise trade deficit of US$189 billion in 2011–12. Its trade with China has the largest deficit, about $31 billion in 2013. India's reliance on external assistance and concessional debt has decreased since liberalisation of the economy, and the debt service ratio decreased from 35.3% in 1990–91 to 4.4% in 2008–09. In India, external commercial borrowings (ECBs), or commercial loans from non-resident lenders, are being permitted by the government for providing an additional source of funds to Indian corporates. The Ministry of Finance monitors and regulates them through ECB policy guidelines issued by the Reserve Bank of India (RBI) under the Foreign Exchange Management Act of 1999. India's foreign exchange reserves have steadily risen from $5.8 billion in March 1991 to $426 billion in April 2018. In 2012, the United Kingdom announced an end to all financial aid to India, citing the growth and robustness of Indian economy. India's current account deficit reached an all-time high in 2013. India has historically funded its current account deficit through borrowings by companies in the overseas markets or remittances by non-resident Indians and portfolio inflows. From April 2016 to January 2017, RBI data showed that, for the first time since 1991, India was funding its deficit through foreign direct investment inflows. The Economic Times noted that the development was "a sign of rising confidence among long-term investors in Prime Minister Narendra Modi's ability to strengthen the country's economic foundation for sustained growth". As the third-largest economy in the world in PPP terms, India has attracted foreign direct investment (FDI). During the year 2011, FDI inflow into India stood at $36.5 billion, 51.1% higher than the 2010 figure of $24.15 billion. India has strengths in telecommunication, information technology and other significant areas such as auto components, chemicals, apparels, pharmaceuticals, and jewellery. Despite a surge in foreign investments, rigid FDI policies were a significant hindrance. Over time, India has adopted a number of FDI reforms. India has a large pool of skilled managerial and technical expertise. The size of the middle-class population stands at 300 million and represents a growing consumer market. India liberalised its FDI policy in 2005, allowing up to a 100% FDI stake in ventures. Industrial policy reforms have substantially reduced industrial licensing requirements, removed restrictions on expansion and facilitated easy access to foreign technology and investment. The upward growth curve of the real-estate sector owes some credit to a booming economy and liberalised FDI regime. In March 2005, the government amended the rules to allow 100% FDI in the construction sector, including built-up infrastructure and construction development projects comprising housing, commercial premises, hospitals, educational institutions, recreational facilities, and city- and regional-level infrastructure. Between 2012 and 2014, India extended these reforms to defence, telecom, oil, retail, aviation, and other sectors. From 2000 to 2010, the country attracted $178 billion as FDI. The inordinately high investment from Mauritius is due to routing of international funds through the country given significant tax advantages – double taxation is avoided due to a tax treaty between India and Mauritius, and Mauritius is a capital gains tax haven, effectively creating a zero-taxation FDI channel. FDI accounted for 2.1% of India's GDP in 2015. As the government has eased 87 foreign investment direct rules across 21 sectors in the last three years, FDI inflows hit $60.1 billion between 2016 and 2017 in India. Since 2000, Indian companies have expanded overseas, investing FDI and creating jobs outside India. From 2006 to 2010, FDI by Indian companies outside India amounted to 1.34 per cent of its GDP. Indian companies have deployed FDI and started operations in the United States, Europe and Africa. The Indian company Tata is the United Kingdom's largest manufacturer and private-sector employer. In 2015, a total of US$68.91 billion was made in remittances to India from other countries, and a total of US$8.476 billion was made in remittances by foreign workers in India to their home countries. The UAE, the US, and Saudi Arabia were the top sources of remittances to India, while Bangladesh, Pakistan and Nepal were the top recipients of remittances from India. Remittances to India accounted for 3.32% of the country's GDP in 2015. Between 1985 and 2018 20,846 deals have been announced in, into (inbound) and out of (outbound) India. This cumulates to a value of 618 bil. USD. In terms of value, 2010 has been the most active year with deals worth almost 60 bil. USD. Most deals have been conducted in 2007 (1,510). 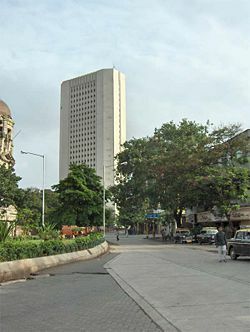 The RBI's headquarters in Mumbai, Maharashtra. The Indian rupee (₹) is the only legal tender in India, and is also accepted as legal tender in neighbouring Nepal and Bhutan, both of which peg their currency to that of the Indian rupee. The rupee is divided into 100 paisas. The highest-denomination banknote is the ₹2,000 note; the lowest-denomination coin in circulation is the 50 paise coin. Since 30 June 2011, all denominations below 50 paise have ceased to be legal currency. India's monetary system is managed by the Reserve Bank of India (RBI), the country's central bank. Established on 1 April 1935 and nationalised in 1949, the RBI serves as the nation's monetary authority, regulator and supervisor of the monetary system, banker to the government, custodian of foreign exchange reserves, and as an issuer of currency. It is governed by a central board of directors, headed by a governor who is appointed by the Government of India. The benchmark interest rates are set by the Monetary Policy Committee. The rupee was linked to the British pound from 1927 to 1946, and then to the US dollar until 1975 through a fixed exchange rate. It was devalued in September 1975 and the system of fixed par rate was replaced with a basket of four major international currencies: the British pound, the US dollar, the Japanese yen and the Deutsche Mark. In 1991, after the collapse of its largest trading partner, the Soviet Union, India faced the major foreign exchange crisis and the rupee was devalued by around 19% in two stages on 1 and 2 July. In 1992, a Liberalized Exchange Rate Mechanism (LERMS) was introduced. Under LERMS, exporters had to surrender 40 percent of their foreign exchange earnings to the RBI at the RBI-determined exchange rate; the remaining 60% could be converted at the market-determined exchange rate. In 1994, the rupee was convertible on the current account, with some capital controls. After the sharp devaluation in 1991 and transition to current account convertibility in 1994, the value of the rupee has been largely determined by market forces. The rupee has been fairly stable during the decade 2000–2010. In September 2013, the rupee touched an all-time low 68.27 to the US dollar. India's gross national income per capita had experienced high growth rates since 2002. It tripled from ₹19,040 in 2002–03 to ₹53,331 in 2010–11, averaging 13.7% growth each of these eight years, with peak growth of 15.6% in 2010–11. However growth in the inflation-adjusted per-capita income of the nation slowed to 5.6% in 2010–11, down from 6.4% in the previous year. These consumption levels are on an individual basis. The average family income in India was $6,671 per household in 2011. According to 2011 census data, India has about 330 million houses and 247 million households. The household size in India has dropped in recent years, the 2011 census reporting 50% of households have four or fewer members, with an average 4.8 members per household including surviving grandparents. These households produced a GDP of about $1.7 trillion. Consumption patterns note: approximately 67% of households use firewood, crop residue or cow-dung cakes for cooking purposes; 53% do not have sanitation or drainage facilities on premises; 83% have water supply within their premises or 100 metres (330 ft) from their house in urban areas and 500 metres (1,600 ft) from the house in rural areas; 67% of the households have access to electricity; 63% of households have landline or mobile telephone service; 43% have a television; 26% have either a two- or four-wheel motor vehicle. Compared to 2001, these income and consumption trends represent moderate to significant improvements. One report in 2010 claimed that high-income households outnumber low-income households. New World Wealth publishes reports tracking the total wealth of countries, which is measured as the private wealth held by all residents of a country. According to New World Wealth, India's total wealth increased from $3,165 billion in 2007 to $8,230 billion in 2017, a growth rate of 160%. India's total wealth rose by 25% from $6.2 trillion in 2016 to $8.23 trillion in 2017, making it the sixth wealthiest nation in the world. There are 20,730 multimillionaires (7th largest in the world) and 119 billionaires in India (3rd largest in the world). With 330,400 high net-worth individuals (HNWI), India is home to the 9th highest number of HNWIs in the world. Mumbai is the wealthiest Indian city and the 12th wealthiest in the world, with a total net worth of $950 billion in 2017. Twenty-eight billionaires reside in the city. As of December 2016,[update] the next wealthiest cities in India were Delhi ($450 billion), Bangalore ($320 billion), Hyderabad ($310 billion), Kolkata ($290 billion), Chennai ($150 billion) and Gurgaon ($110 billion). Poverty rate map of India by prevalence in 2012, among its states and union territories. In May 2014, the World Bank reviewed and proposed revisions to its poverty calculation methodology of 2005 and purchasing-power-parity basis for measuring poverty. According to the revised methodology, the world had 872.3 million people below the new poverty line, of which 179.6 million lived in India. With 17.5% of the total world's population, India had a 20.6% share of world's poorest in 2013. According to a 2005–2006 survey, India had about 61 million children under the age of 5 who were chronically malnourished. A 2011 UNICEF report stated that between 1990 and 2010, India achieved a 45 percent reduction in under age 5 mortality rates, and now ranks 46th of 188 countries on this metric. Since the early 1960s, successive governments have implemented various schemes to alleviate poverty, under central planning, that have met with partial success. In 2005, the government enacted the Mahatma Gandhi National Rural Employment Guarantee Act (MGNREGA), guaranteeing 100 days of minimum wage employment to every rural household in all the districts of India. In 2011, it was widely criticised and beset with controversy for corrupt officials, deficit financing as the source of funds, poor quality of infrastructure built under the programme, and unintended destructive effects. Other studies suggest that the programme has helped reduce rural poverty in some cases. Yet other studies report that India's economic growth has been the driver of sustainable employment and poverty reduction, though a sizeable population remains in poverty. Agricultural and allied sectors accounted for about 52.1% of the total workforce in 2009–10. While agriculture employment has fallen over time in percentage of labour employed, services which includes construction and infrastructure have seen a steady growth accounting for 20.3% of employment in 2012–13. Of the total workforce, 7% is in the organised sector, two-thirds of which are in the government-controlled public sector. About 51.2% of the workforce in India is self-employed. According to a 2005–06 survey, there is a gender gap in employment and salaries. In rural areas, both men and women are primarily self-employed, mostly in agriculture. In urban areas, salaried work was the largest source of employment for both men and women in 2006. Unemployment in India is characterised by chronic (disguised) unemployment. Government schemes that target eradication of both poverty and unemployment – which in recent decades has sent millions of poor and unskilled people into urban areas in search of livelihoods – attempt to solve the problem by providing financial assistance for starting businesses, honing skills, setting up public sector enterprises, reservations in governments, etc. The decline in organised employment, due to the decreased role of the public sector after liberalisation, has further underlined the need for focusing on better education and created political pressure for further reforms. India's labour regulations are heavy, even by developing country standards, and analysts have urged the government to abolish or modify them in order to make the environment more conducive for employment generation. The 11th five-year plan has also identified the need for a congenial environment to be created for employment generation, by reducing the number of permissions and other bureaucratic clearances required. Inequalities and inadequacies in the education system have been identified as an obstacle, which prevents the benefits of increased employment opportunities from reaching all sectors of society. Child labour in India is a complex problem that is rooted in poverty. Since the 1990s, the government has implemented a variety of programs to eliminate child labour. These have included setting up schools, launching free school lunch programs, creating special investigation cells, etc. Author Sonalde Desai stated that recent studies on child labour in India have found some pockets of industries in which children are employed, but overall, relatively few Indian children are employed. Child labour below the age of 10 is now rare. In the 10–14 age group, the latest surveys find only 2% of children working for wage, while another 9% work within their home or rural farms assisting their parents in times of high work demand such as sowing and harvesting of crops. India has the largest diaspora around the world, an estimated 16 million people, many of whom work overseas and remit funds back to their families. The Middle East region is the largest source of employment of expat Indians. The crude oil production and infrastructure industry of Saudi Arabia employs over 2 million expat Indians. Cities such as Dubai and Abu Dhabi in United Arab Emirates have employed another 2 million Indians during the construction boom in recent decades. In 2009–10, remittances from Indian migrants overseas stood at ₹2,500 billion (US$35 billion), the highest in the world, but their share in FDI remained low at around 1%. Corruption has been a pervasive problem in India. A 2005 study by Transparency International (TI) found that more than half of those surveyed had first-hand experience of paying a bribe or peddling influence to get a job done in a public office in the previous year. A follow-up study in 2008 found this rate to be 40 percent. In 2011, TI ranked India at 95th place amongst 183 countries in perceived levels of public sector corruption. By 2016, India saw a reduction in corruption and its ranking improved to 79th place. Computerisation of services, various central and state vigilance commissions, and the 2005 Right to Information Act – which requires government officials to furnish information requested by citizens or face punitive action – have considerably reduced corruption and opened avenues to redress grievances. In 2011, the Indian government concluded that most spending fails to reach its intended recipients, as the large and inefficient bureaucracy consumes budgets. India's absence rates are among the worst in the world; one study found that 25% of public sector teachers and 40% of government-owned public-sector medical workers could not be found at the workplace. Similarly, there are many issues facing Indian scientists, with demands for transparency, a meritocratic system, and an overhaul of the bureaucratic agencies that oversee science and technology. University of Calcutta, established in 1857, was the first multidisciplinary and secular Western-style institution in Asia. India has made progress increasing the primary education attendance rate and expanding literacy to approximately three-fourths of the population. India's literacy rate had grown from 52.2% in 1991 to 74.04% in 2011. The right to education at elementary level has been made one of the fundamental rights under the eighty-sixth Amendment of 2002, and legislation has been enacted to further the objective of providing free education to all children. However, the literacy rate of 74% is lower than the worldwide average and the country suffers from a high drop-out rate. Literacy rates and educational opportunities vary by region, gender, urban and rural areas, and among different social groups. Poverty rates in India's poorest states are three to four times higher than those in the more advanced states. While India's average annual per capita income was $1,410 in 2011 – placing it among the poorest of the world's middle-income countries – it was just $436 in Uttar Pradesh (which has more people than Brazil) and only $294 in Bihar, one of India's poorest states. A critical problem facing India's economy is the sharp and growing regional variations among India's different states and territories in terms of poverty, availability of infrastructure and socio-economic development. Six low-income states – Assam, Chhattisgarh, Nagaland, Madhya Pradesh, Odisha and Uttar Pradesh – are home to more than one-third of India's population. Severe disparities exist among states in terms of income, literacy rates, life expectancy and living conditions. The five-year plans, especially in the pre-liberalisation era, attempted to reduce regional disparities by encouraging industrial development in the interior regions and distributing industries across states. The results have been discouraging as these measures increased inefficiency and hampered effective industrial growth. The more advanced states have been better placed to benefit from liberalisation, with well-developed infrastructure and an educated and skilled workforce, which attract the manufacturing and service sectors. Governments of less-advanced states have tried to reduce disparities by offering tax holidays and cheap land, and focused on sectors like tourism which can develop faster than other sectors. India's income Gini coefficient is 33.9, according to the United Nations Development Program (UNDP), indicating overall income distribution to be more uniform than East Asia, Latin America and Africa. There is a continuing debate on whether India's economic expansion has been pro-poor or anti-poor. Studies suggest that economic growth has been pro-poor and has reduced poverty in India. Bombay Stock Exchange in Mumbai, which is Asia's first stock exchange. The development of Indian security markets began with the launch of the Bombay Stock Exchange (BSE) in July 1875 and Ahmedabad Stock exchange in 1894. Since then, 22 other exchanges have traded in Indian cities. 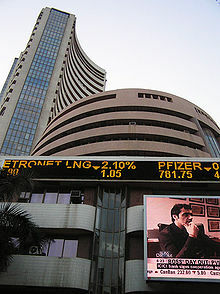 In 2014, India's stock exchange market became the 10th largest in the world by market capitalisation, just above those of South Korea and Australia. India's two major stock exchanges, BSE and National Stock Exchange of India, had a market capitalisation of US$1.71 trillion and US$1.68 trillion as of February 2015,[update] according to World Federation of Exchanges. The initial public offering (IPO) market in India has been small compared to NYSE and NASDAQ, raising US$300 million in 2013 and US$1.4 billion in 2012. Ernst & Young stated that the low IPO activity reflects market conditions, slow government approval processes and complex regulations. Before 2013, Indian companies were not allowed to list their securities internationally without first completing an IPO in India. In 2013, these security laws were reformed and Indian companies can now choose where they want to list first: overseas, domestically, or both concurrently. Further, security laws have been revised to ease overseas listings of already-listed companies, to increase liquidity for private equity and international investors in Indian companies. ^ "Information About Maharashtra, Industries, Economy, Exports of Maharashtra". ibef.org. Retrieved 12 April 2014. ^ SUDALAIMUTHU, S.; RAJ, S.A. (2009). Logistics Management for International Business: Text and Cases. PHI Learning. ISBN 9788120337923. ^ a b c d "World Economic Outlook Database, April 2019". IMF.org. International Monetary Fund. Retrieved 9 April 2019. ^ "January 2019 Global Economic Prospects -- Darkening Skies p. 103" (PDF). openknowledge.worldbank.org. World Bank. Retrieved 17 March 2019. ^ "Sector-wise Contribution of GDP of India-Statistics.com". StatisticsTimes.com. Retrieved 11 August 2017. ^ "CONSUMER PRICE INDEX NUMBERS ON BASE 2019 =100 FOR RURAL, URBAN AND COMBINED FOR THE MONTH OF January 2019" (PDF). MINISTRY OF STATISTICS AND PROGRAMME IMPLEMENTATION. Retrieved 12 February 2019. ^ "Weekly Statistical Supplement – Ratio and Rates". Reserve Bank of India. Retrieved 4 April 2019. ^ Kharas, Homi; Hamel, Kristofer; Hofer, Martin (19 June 2018). "The start of a new poverty narrative". The Brookings Institution. Retrieved 3 August 2018. ^ Adebayo, Bukola (26 June 2018). "Nigeria overtakes India in extreme poverty ranking". CNN. Retrieved 3 August 2018. ^ a b "Income Gini coefficient". United Nations Development Program. Retrieved 14 January 2017. ^ a b c d "Human Development Report 2018" (PDF). United Nations Development Program. Retrieved 23 September 2018. ^ "Labor force, total". World Bank. World Bank. Retrieved 27 January 2019. ^ "The World Factbook". www.cia.gov. Retrieved 27 January 2019. ^ "India Unemployment Rate". World Bank. World Bank. Retrieved 26 January 2019. ^ a b c d "India – WTO Statistics Database". World Trade Organization. Retrieved 23 September 2018. ^ "Country Fact Sheets 2018". unctad.org. Retrieved 8 June 2018. ^ Ranjan Misra, Asit (30 March 2019). "India's current account deficit narrows to 2.5% of GDP, fiscal deficit widens". Livemint. Retrieved 16 April 2019. ^ "India's External Debt as at the end of September 2018". Reserve Bank of India. Retrieved 6 January 2019. ^ "India's External Debt" (PDF). Ministry of Finance. 31 March 2018. Retrieved 4 April 2019. ^ "International Investment Position". Reserve Bank of India. 31 March 2019. Retrieved 6 January 2019. ^ "World Economic Outlook Database, July 2018 – Report for Selected Countries and Subjects – General government gross debt". International Monetary Fund. Retrieved 23 September 2018. ^ a b "Report for Selected Countries and Subjects – General government revenue/General government total expenditure". IMF. Retrieved 21 May 2018. ^ "Net official development assistance received (current US$)". World Bank. Retrieved 25 March 2018. ^ "Moody's upgrades India's government bond rating to Baa2 from Baa3; changes outlook to stable from positive". Moody's. 30 November 2017. Retrieved 16 November 2017. ^ "Fitch – Complete Sovereign Rating History". Retrieved 25 February 2013. ^ "Weekly Statistical Supplement – Foreign Exchange Reserves". ^ Sumit, Ganguly (2011). India Since 1980. Cambridge University Press. ISBN 978-1-139-49866-1. ^ Data refer to the year 2016. (selecting all countries, GDP per capita (current US$), World Bank). Accessed on 1 July 2017. ^ "World Economic Outlook October 2018: Report for Selected Countries and Subjects". International Monetary Fund (IMF). Retrieved 18 November 2018. ^ "The World Factbook — Central Intelligence Agency". www.CIA.gov. Retrieved 2 November 2017. ^ "India Tops World Bank's Growth Outlook for First Time; Bomb Attack on Afghan News Agency; Deadly Week for Quetta Police Force". ForeignPolicy.com. Retrieved 2 November 2017. ^ a b "India has second fastest growing services sector". The Hindu. ^ "Indian IT-BPM Industry FY16 Performance and FY17 Outlook" (PDF). NASSCOM. Retrieved 22 June 2017. ^ Menezes, Beryl (10 February 2015). "Indian IT services exports seen growing 12-14% in year ahead". LiveMint.com. Retrieved 2 November 2017. ^ "India's services export in July up 7.4% at USD 13.34bn". Moneycontrol. Retrieved 2 November 2017. ^ India, Press Trust of (27 February 2015). "India 4th largest start-up hub in world: Eco survey". Retrieved 2 November 2017 – via Business Standard. ^ "Current Gross Domestic Product (GDP) of India". SimpleInterest.in. Retrieved 2 November 2017. ^ Bhupta, Malini (6 February 2015). "India set to become world's fastest growing e-commerce market". Retrieved 2 November 2017 – via Business Standard. ^ Donkin, Robin A. (August 2003). Between East and West: The Moluccas and the Traffic in Spices Up to the Arrival of Europeans. Diane Publishing Company. ISBN 0-87169-248-1. ^ M. K. Kuriakose, History of Christianity in India: Source Materials, (Bangalore: United Theological College, 1982), pp. 10–12. Kuriakose gives a translation of the related but later copper plate grant to Iravi Kortan on pp. 14–15. For earlier translations, see S. G. Pothan, The Syrian Christians of Kerala, (Bombay: Asia Publishing House, 1963), pp. 102–105. ^ a b "Economic survey of India 2007: Policy Brief" (PDF). OECD. Archived from the original (PDF) on 6 June 2011. Retrieved 21 June 2009. ^ a b Edward A. Gargan (15 August 1992). "India Stumbles in Rush to a Free Market Economy". The New York Times. Retrieved 17 January 2011. ^ "India's Rising Growth Potential" (PDF). Goldman Sachs. 2007. Archived from the original (PDF) on 24 July 2011. Retrieved 21 June 2009. ^ Nehru, Jawaharlal (1946). The Discovery of India. Penguin Books. ISBN 0-14-303103-1. ^ "2000 years economic history one chart". Retrieved 29 August 2017. ^ Stephen Frederic Dale (2002), Indian Merchants and Eurasian Trade, 1600–1750, Cambridge University Press, ISBN 0-521-52597-7, ... The Russian merchant, F.A. Kotov ... saw in Isfahan in 1623, both Hindus and Muslims, as Multanis. ^ Carlo M. Cipolla (2004). Before the Industrial Revolution: European Society and Economy 1000–1700. Routledge. ^ Vivek Suneja (2000). Understanding Business: A Multidimensional Approach to the Market Economy. Psychology Press. p. 13. ^ a b c d e Jeffrey G. Williamson, David Clingingsmith (August 2005). "India's Deindustrialization in the 18th and 19th Centuries" (PDF). Harvard University. Retrieved 18 May 2017. ^ Eraly, Abraham (2007). The Mughal World: Life in India's Last Golden Age. Penguin Books India. p. 5. ISBN 978-0-14-310262-5. ^ Richards, John F. (1995). The Mughal Empire. Cambridge University Press. p. 202. ISBN 978-0-521-56603-2. ^ Jeffrey G. Williamson (2011). Trade and Poverty: When the Third World Fell Behind. MIT Press. p. 91. ^ Kirti N. Chaudhuri (2006). The Trading World of Asia and the English East India Company: 1660–1760. Cambridge University Press. p. 253. ^ P. J. Marshall (2006). Bengal: The British Bridgehead: Eastern India 1740–1828. Cambridge University Press. p. 73. ^ Andre Gunder Frank, Robert A. Denemark (2015). Reorienting the 19th Century: Global Economy in the Continuing Asian Age. Routledge. pp. 83–85. ^ James Cypher (2014). The Process of Economic Development. Routledge. ^ Broadberry, Stephen; Gupta, Bishnupriya (2005). "Cotton textiles and the great divergence: Lancashire, India and shifting competitive advantage, 1600–1850" (PDF). International Institute of Social History. Department of Economics, University of Warwick. Retrieved 5 December 2016. ^ Paul Bairoch (1995). Economics and World History: Myths and Paradoxes. University of Chicago Press. p. 89. ^ Angus Maddison (2007). The World Economy Volume 1: A Millennial Perspective Volume 2: Historical Statistics. Academic Foundation. p. 260. ^ Staley, Sam (2006). "The Rise and Fall of Indian Socialism: Why India embraced economic reform". Reason. Retrieved 17 January 2011. ^ Data Source: Tables of Prof. Angus Maddison (2010). The per capita GDP over various years and population data can be downloaded in a spreadsheet from here. ^ The 2015 estimate is retrieved from the International Monetary Fund. ^ a b Das, Gurcharan (2002). India Unbound. Anchor Books. pp. 167–174. ISBN 978-0-385-72074-8. ^ Cameron, John; Ndhlovu, P Tidings (September 2001). "Cultural Influences on Economic Thought in India: Resistance to diffusion of neo-classical economics and the principles of Hinduism" (PDF). Economic Issues. 6 (2). Archived from the original (PDF) on 23 August 2006. Retrieved 17 January 2011. ^ Roy, Subroto (22 September 1998). "Milton Friedman on the Nehru/Mahalanobis Plan". India Policy Institute. Retrieved 16 July 2005. ^ Tripathi, Salil (13 June 2006). "Escaping the 'Hindu rate of growth'". The Guardian. London. Retrieved 25 November 2010. ^ "Narasimha Rao – a Reforming PM". news.bbc.co.uk. BBC News. 23 December 2004. Retrieved 2 March 2007. ^ V. Venkatesan (1–14 January 2005). "Obituary: A scholar and a politician". Frontline. 22 (1). Archived from the original on 30 January 2010. Retrieved 30 March 2010. ^ Ghosh, Arunabha (1 June 2004). "India's pathway through economic crisis(which makes failer of mixed economy)" (PDF). GEG Working Paper 2004/06. Global Economic Governance Programme. Archived from the original (PDF) on 12 November 2011. Retrieved 12 December 2009. ^ Task Force Report 2006, p. 7. ^ Task Force Report 2006, pp. 7–8. ^ "That old Gandhi magic". The Economist. 27 November 1997. Retrieved 17 January 2011. ^ Task Force Report 2006, pp. 17–20. ^ S. Venkitaramanan (10 February 2003). "Moody's upgrade – Uplifts the mood but raises questions". Business Line. Retrieved 17 January 2011. ^ "World Economic Situation and Prospects 2010". United Nations Department of Economic and Social Affairs, Development Policy and Analysis Division. ISBN 978-92-1-109160-1. Retrieved 2 March 2018. ^ Wilson, Dominic; Purushothaman, Roopa (1 October 2003). "DreamingWith BRICs: The Path to 2050" (PDF). Global economics paper No. 99. Goldman Sachs. Archived from the original (PDF) on 26 September 2007. Retrieved 4 October 2007. ^ Grammaticas, Damian (24 January 2007). "Indian economy 'to overtake UK'". BBC News. Retrieved 26 January 2007. ^ "PRESS NOTE ON SECOND ADVANCE ESTIMATES OF NATIONAL INCOME 2017–18" (PDF). Ministry of Statistics and Programme Implementation. Retrieved 26 May 2018. ^ "Demonetisation, GST impact: IMF lowers India's 2017 growth forecast to 6.7%". Hindustan Times. 10 October 2017. Retrieved 26 May 2018. ^ "Business Reforms Action Plan". Business Reforms Action Plan. Retrieved 8 July 2016. ^ "Indian Economy At a Glance". Retrieved 9 October 2015. ^ a b c d e f g "BENCHMARK REPORT 2017 – INDI" (PDF). World Travel and Tourism Council. Retrieved 11 April 2018. ^ Economic Survey 2010, p. 180. ^ The Government of Punjab (2004). Human Development Report 2004, Punjab (PDF) (Report). Archived (PDF) from the original on 8 July 2011. Retrieved 9 August 2011. Section: "The Green Revolution", pp. 17–20. ^ "India – Land and Water Resources at a glance". Central Water Commission, Government of India. Retrieved 18 November 2010. ^ a b "State-Wise Details of Net Irrigated Area (NIA), Net Sown Area (NSA) And Percentage of NIA To NSA" (PDF). Ministry of Water Resources, Government of India. Archived from the original (PDF) on 21 July 2011. Retrieved 18 November 2010. ^ "Fishery – Global Comparison". Retrieved 9 October 2015. ^ a b "Cashew industry : Challenges and Opportunities" (PDF). Retrieved 22 March 2016. ^ "Economist – Global livestock counts". Retrieved 9 October 2015. ^ "Major Food And Agricultural Commodities And Producers – Countries By Commodity". FAO. Retrieved 12 December 2009. ^ "Rise in earnings from cashew kernel exports – The Hindu". Retrieved 22 March 2016. ^ "Govt eyes bumper agriculture production on good monsoon hopes". Retrieved 22 June 2016. ^ Sengupta, Somini (22 June 2008). "The Food Chain in Fertile India, Growth Outstrips Agriculture". The New York Times. Retrieved 29 March 2010. ^ "India: Priorities for Agriculture and Rural Development". World Bank. Retrieved 8 January 2011. ^ "Agriculture production to double with Rs 80000 crore irrigation scheme, others: Nitin Gadkari". Daily News and Analysis. Retrieved 22 June 2016. ^ a b "India's Food Transportation Ordeal". The Wall Street Journal. 11 January 2013. ^ a b "India – All Economic Indicators on Quandl". Archived from the original on 7 January 2013. Retrieved 8 October 2013. ^ Task Force Report 2006, pp. 9–10. ^ "The seven homegrown firms fighting over India's $621 billion defence market". Quartz. Retrieved 12 November 2015. ^ "BP Statistical Review 2016" (PDF). Retrieved 29 May 2016. ^ a b "CIA – The World Factbook – India". CIA. 20 September 2007. Retrieved 2 October 2007. ^ a b "Indian Petroleum & Natural Gas Statistics, 2014–15" (PDF). Archived from the original (PDF) on 5 December 2014. Retrieved 19 January 2016. ^ "Reliance Net Beats Estimate After Boosting Natural Gas Sales". BusinessWeek. 27 January 2010. Archived from the original on 15 September 2011. Retrieved 5 April 2010. ^ "BP Statistical Review of world electric energy, 2015" (PDF). Archived from the original (PDF) on 4 July 2015. Retrieved 17 June 2015. ^ "Vidyut Pravah – See FAQ section for more information". Retrieved 3 June 2016. ^ "All India Installed Capacity (In MW) Of Power Stations" (PDF). Archived from the original (PDF) on 5 July 2016. Retrieved 9 June 2016. ^ "Inventory of Coal Resources of India". Ministry of Coal, Government of India. Archived from the original on 19 April 2010. Retrieved 18 November 2010. ^ "Uranium shortage holding back India's nuclear power drive". Mint. 30 June 2008. Retrieved 5 April 2010. ^ Subramanian, T. S. (20 March 2011). "Massive uranium deposits found in Andhra Pradesh". The Hindu. Chennai, India. ^ Thakur, Monami (19 July 2011). "Massive uranium deposits found in Andhra Pradesh". International Business Times. US. ^ "Availability of Thorium". Press Information Bureau, Government of India. 10 August 2011. Retrieved 27 March 2012. ^ "Bush signs India-US nuclear deal into law". Mint. 9 October 2008. Retrieved 5 April 2010. ^ "Making a case for higher engineering exports". The Financial Express. 24 July 2014. ^ Khanna, Pankaj. "How Gems & Jewellery Sector Plays A Significant Role In The Indian Economy". BW Businessworld. Retrieved 26 November 2018. ^ a b "Basic Road Statistics of India 2013–14 and 2014–15". Ministry of Road Transport & Highways. Retrieved 12 November 2016. ^ "India Transport Sector". World Bank. ^ "National Highway Development Project (NHDP)". NHAI, Ministry of Roads Transport, Govt of India. July 2014. Archived from the original on 15 May 2016. ^ "Annual report 2010–2011,". Ministry of Road transport and highways. Retrieved 7 February 2012. ^ a b "Medical tourism to keep pharma industry in good health: Study". dna. 20 February 2017. Retrieved 20 February 2017. ^ "Textile Industry in India: Latest facts, figures and government schemes". India Today. Retrieved 27 January 2019. ^ "Helping Tirupur emerge as a leader in knitwear exports in India". The Hindu. Chennai. 11 June 2007. Retrieved 17 January 2011. ^ "Textile Industry in India, Indian Textile Industry, Garment Industry". IBEF, Govt of India. Retrieved 12 April 2014. ^ Neal, John (23 February 2014). "The task of protecting India's child cotton pickers". www.bbc.co.uk. The BBC. Retrieved 23 February 2014. ^ "Top Paper Companies in India". papermart.in. 31 May 2010. ^ "India beats China in paper market growth despite dumping fears". The Financial Express. 15 January 2019. Retrieved 27 January 2019. ^ "India becomes fourth largest aviation market in the world". Media India Group. 21 April 2017. Retrieved 14 October 2017. ^ a b c d "Potential and Challenges of Indian Aviation". IATA. Retrieved 26 November 2018. ^ "Kingfisher Air nets monster jumbo". Online edition of the Financial Express. 14 June 2005. Archived from the original on 14 May 2013. Retrieved 11 June 2009. ^ "High fives with $3bn Kingfisher order". Flightglobal.com. 16 June 2005. Archived from the original on 5 November 2012. Retrieved 11 June 2009. ^ Our Bureau. "GoAir sees profit for second year in a row". The Hindu Business Line. ^ Ghosh, Jayati (21 July 2005). "Bank Nationalisation: The Record". Macroscan. Economic Research Foundation. Archived from the original on 23 October 2005. Retrieved 11 January 2011. ^ Farrell, Diana; Susan Lund. "Reforming India's Financial System" (PDF). United Nations Public Administration Network. Retrieved 11 January 2011. ^ D'Silva, Jeetha (1 September 2007). "India growth story is attracting talent from govt establishments". Mint. Retrieved 11 January 2011. ^ "Fintech revolution in India: Tech-finance collaboration has fired up entrepreneurs". The Financial Express. 23 May 2016. Archived from the original on 26 May 2016. Retrieved 23 May 2016. ^ "India emerging as fastest-growing market for fintech software products". ZDNet. 3 May 2016. Retrieved 22 May 2016. ^ a b "Indian IT-BPO Industry". NASSCOM. Archived from the original on 20 December 2012. Retrieved 15 December 2012. ^ Mitra, Sramana (29 February 2008). "The Coming Death of Indian Outsourcing". Forbes. Retrieved 10 January 2010. ^ Sheth, Niraj (28 May 2009). "Outlook for Outsourcing". The Wall Street Journal. Retrieved 5 April 2010. ^ a b c "India's outsourcing revenue to hit $50 bn". Financial Express. 2008. ^ "Insurance penetration in India grows just 1% in last one and half decade; These six charts explain why". Firstpost. Retrieved 27 January 2019. ^ "Winning the Indian consumer". McKinsey & Company. 2005. ^ Majumder, Sanjoy (25 November 2011). "Changing the way Indians shop". BBC News. ^ "Market Realist". marketrealist.com. Retrieved 27 January 2019. ^ a b "Retailing in India: Unshackling the chain stores". The Economist. 29 May 2008. Retrieved 10 January 2010. ^ "Travel & Tourism Economic Impact 2018 India" (PDF). World Travel and Tourism Council. Retrieved 22 March 2017. ^ Team, BS Web (17 January 2018). "India attracted 10 mn foreign tourists in 2017, sports to bring more". Business Standard India. Retrieved 11 February 2018. ^ "India Tourism Statistics at a Glance 2015" (PDF). ^ Mudur, Ganapati (June 2004). "Hospitals in India woo foreign patients". British Medical Journal. 328 (7452): 1338. doi:10.1136/bmj.328.7452.1338. PMC 420282. PMID 15178611. ^ "Medical Tourism draws Americans to India". Washington Times. 18 August 2013. ^ "Indian medical tourism industry to touch $8 billion by 2020: Grant Thornton – The Economic Times". The Economic Times. Retrieved 16 April 2016. ^ "Promotion of Medical Tourism". Press Information Bureau. Retrieved 28 April 2016. ^ "Media and Entertainment Industry May Touch Rs 3.73 Lakh Crore by 2022: Study". News18. Retrieved 27 January 2019. ^ "Indian ayurvedic industry to grow to $ 4.4 billion by the end of this year". The Economic Times. 19 November 2018. Retrieved 26 November 2018. ^ "Economic Survey 2018: 5 states show the way with 70% of exports, enjoy higher standard of living". The Indian Express. 30 January 2018. Retrieved 11 February 2018. ^ Chakraborty, Subhayan (29 January 2018). "Only 5 states account for 70% of exports, Economic Survey shows". Business Standard India. Retrieved 11 February 2018. ^ Vashistha, Praveen (18 January 2019). "Future and Growth of Transportation Market by 2020". Entrepreneur. Retrieved 27 January 2019. ^ "Global Rankings 2016 | Logistics Performance Index". World Bank. Retrieved 11 February 2018. ^ "Telecom sector share in GDP marginally up at 1.94% in FY15 – Latest News & Updates at Daily News & Analysis". DNAIndia.com. 23 December 2015. Retrieved 2 November 2017. ^ "Indian Readership Survey 2012 Q1 : Topline Findings" (PDF). Media Research Users Council. Growth: Literacy & Media Consumption. Archived from the original (PDF) on 7 April 2014. Retrieved 12 September 2012. ^ "Telecom Subscription data, May 2016" (PDF) (Press release). TRAI. 18 May 2016. Archived from the original (PDF) on 15 June 2016. Retrieved 14 July 2016. ^ Cite error: The named reference MoM_doc1 was invoked but never defined (see the help page). ^ "Indian Steel Industry Analysis". Ibef.org. Retrieved 7 January 2016. ^ "An Overview of the steel sector – Ministry of Steel, Government of India". Steel.gov.in. 16 January 1992. Archived from the original on 7 January 2016. Retrieved 7 January 2016. ^ Srinivasan, T.N. (2002). "Economic Reforms and Global Integration" (PDF). 17 January 2002. Economic Growth Center, Yale University. Archived from the original (PDF) on 26 March 2009. Retrieved 21 June 2009. ^ a b "Trade profiles-India". World Trade Organization. Retrieved 7 February 2012. ^ "Imports and Exports Databank". Ministry of Commerce and Industry, Government of India. Retrieved 5 April 2010. ^ "India's Foreign Trade: November 2010" (PDF). Press Release. Ministry of Commerce and Industry, Government of India. 3 January 2011. Archived from the original (PDF) on 24 January 2011. Retrieved 11 January 2011. ^ "India & the World Trade Organization". Embassy of India. Archived from the original on 13 June 2005. Retrieved 9 July 2005. ^ Economic Survey 2010, pp. 127–129. ^ a b V. Ramakrishnan (7 December 2010). "Rupee Rally Falters as Oil Rises to Two-Year High". BusinessWeek. Archived from the original on 11 January 2011. Retrieved 11 January 2011. ^ Economic Survey 2010, p. 127. ^ "India's trade deficit with China mounts to $ 31.42 bn". The Economic Times. 10 January 2014. ^ Economic Survey 2010, pp. 142–144. ^ "Master Circular on External Commercial Borrowings and Trade Credits" (PDF). Reserve Bank of India. Retrieved 11 January 2011. ^ Economic Survey 2010, p. 132. ^ "UK to end financial aid to India". The Financial Times. 9 November 2012. ^ "TABLE-India's forex reserves rise to $318.64 bln as of Aug 29 – cbank". Retrieved 3 March 2015. ^ Nag, Anirban (27 March 2017). "Foreigners to the rescue as inflows rise to bridge India's current account deficit". Mint. Retrieved 4 April 2017. ^ "In a first since 1991, FDI flow takes care of CAD". The Economic Times. Retrieved 4 April 2017. ^ "FDI in India Statistics" (PDF). Ministry of Commerce and Industry, Government of India. Archived from the original (PDF) on 22 November 2010. Retrieved 22 November 2010. ^ a b "India 2nd best country for biz investment: Survey". The Financial Express. Retrieved 3 November 2008. ^ "FinMin considers three single-brand retail FDI proposals". Archived from the original on 21 October 2012. ^ "Next Big Spenders: India's Middle Class". McKinsey & Company. Retrieved 5 April 2010. ^ Ramachandran, Sushma (25 February 2005). "100 per cent FDI in construction industry automatic route". The Hindu. Chennai, India. Retrieved 17 December 2010. ^ "Govt unleashes big-bang FDI reforms, opens up defence". The Times of India. 17 July 2014. ^ "Govt allows FDI multi-brand retail, aviation in bold reform push". Reuters. 14 September 2012. ^ "India FDI Fact sheet – September 2010". Department of Industrial Policy & Promotion, Ministry of Commerce and Industry. Archived from the original on 16 December 2010. Retrieved 21 December 2010. ^ Bhagwati, Jaimini (17 December 2010). "Rationalising FDI taxes". Business Standard. Retrieved 21 December 2010. ^ "India's FDI inflows at a record $60.1 billion in 2016–17". HindustanTimes.com. 19 May 2017. Retrieved 2 November 2017. ^ "FDI jumps 37% to $10.4 billion during April-June 2017". 21 August 2017. Retrieved 2 November 2017 – via The Economic Times. ^ "Mahindra Expands Effort to Counter Global Rivals with U.S. Engineering". The Wall Street Journal. 9 May 2014. ^ "A Slice of World Action". Business Today. 11 November 2012. ^ "India's industrial outpost Tata for now". The Economist. 10 September 2011. ^ "JLR's Ratan Tata warns on UK competitiveness". The Telegraph. 5 December 2012. ^ "Remittance Flows Worldwide in 2015". PewGlobal.org. 31 August 2016. Retrieved 2 November 2017. ^ "M&A Statistics by Countries – Institute for Mergers, Acquisitions and Alliances (IMAA)". Institute for Mergers, Acquisitions and Alliances (IMAA). Retrieved 26 February 2018. ^ "Your Guide to Money Matters". Reserve Bank of India. Archived from the original on 16 January 2011. Retrieved 11 January 2011. ^ "25 paise and below coins not acceptable from June 30 – The Times of India". Times of India. Retrieved 26 January 2011. ^ "Govt to scrap 25 paise coins". NDTV. Retrieved 26 January 2011. ^ "Homes become more affordable in last 10 years". The Times of India. 2 May 2012. ^ "Poverty reduction and equity (2010)". World Bank. July 2012. Retrieved 11 July 2012. ^ a b "Final Figures of Houselisting & Housing Census, 2011 Released". Census 2011, Government of India. 13 March 2012. 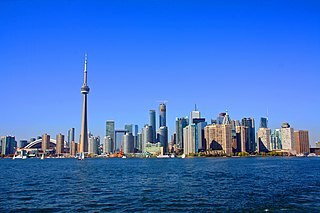 ^ "Median household size drops below 4 in cities". Time of India. 25 March 2012. ^ "Country Report – India (2010)". The World Bank. 2011. ^ Sinha, Prabhakar (1 August 2010). "'India has more rich people than poor now'". The Times of India. Retrieved 15 November 2010. ^ "India 6th wealthiest country with total wealth of $8,230 billion". livemint.com/. 30 January 2018. Retrieved 18 February 2018. ^ "With total wealth of USD 950 billion, Mumbai 12th richest city in the world: New World Wealth Report". www.businesstoday.in. Retrieved 18 February 2018. ^ "'Mumbai richest Indian city with total wealth of $820 bn' – The Economic Times". The Economic Times. Retrieved 26 February 2017. ^ "Mumbai richest Indian city with total wealth of $820 billion: Report". Hindustan Times. 26 February 2017. Retrieved 26 February 2017. ^ "India Statistics". UNICEF, United Nations. 2011. ^ "Economic Survey 2004–2005". Retrieved 15 July 2006. ^ Tom Wright; Harsh Gupta (29 April 2011). "India's Boom Bypasses Rural Poor". The Wall Street Journal. ^ "Indian rural welfare – Digging holes". The Economist. 5 November 2011. ^ James Fontanella-Khan; James Lamont (29 February 2012). "Rural India enjoys consumption boom". The Financial Times. ^ a b "Report on Employment & Unemployment Survey (2012–13)" (PDF). Bureau of Labour Statistics, Indian Government. January 2014. Retrieved 25 July 2014. ^ Economic Survey 2010, pp. 275–277. ^ Kaushik Basu (27 June 2005). "Why India needs labour law reform". BBC. Retrieved 16 December 2010. ^ "Child Labour and India – Embassy of India". Embassy of India. Archived from the original on 23 October 2007. Retrieved 13 March 2009. ^ "India has largest diaspora population in world". Times of India. ^ Banerjee, Ajay (9 January 2011). "NRIs don't invest as much as they remit, says Montek". The Tribune. India. Retrieved 13 January 2011. ^ India: Potential for a Parliamentary Budget Office. Social Science Research Network (SSRN). Accessed 18 July 2017. ^ a b Transparency International India. "India Corruption Study 2005" (PDF). Centre for Media Studies. Archived from the original (PDF) on 15 April 2007. Retrieved 14 March 2008. ^ "India Corruption Study – 2008" (PDF). Transparency International. 2008. ^ "Corruption Perceptions Index 2011". Transparency International. Retrieved 9 July 2012. ^ e.V., Transparency International. "Corruption Perceptions Index 2016". www.transparency.org. Retrieved 18 February 2018. ^ "Survey on Bribery and Corruption – Impact on Economy and Business Environment" (PDF). KPMG. 2011. ^ Debroy and Bhandari (2011). "Corruption in India". The World Finance Review. ^ "Corruption in India – A rotten state". The Economist. 10 March 2011. ^ "India's civil service: Battling the babu raj". The Economist. 6 March 2008. Retrieved 8 January 2011. ^ Muralidharan, Karthik. "Teachers and Medical Worker Incentives in India" (PDF). University of California. Archived from the original (PDF) on 26 March 2009. Retrieved 21 June 2009. ^ Basu, Kaushik (29 November 2004). "Combating India's truant teachers". BBC. Retrieved 9 January 2011. ^ Jayaraman, K.S. (9 November 2009). "Report row ousts top Indian scientist". Nature. Retrieved 19 June 2012. ^ Kuldip Nayar (4 February 2011). "Laundering black money". Deccan Herald. India. Retrieved 6 February 2011. ^ V. Venkateswara Rao (13 August 2010). "Black, bold and bountiful". The Hindu Business Line. Archived from the original on 18 September 2011. Retrieved 6 February 2011. ^ "No 'black money' statistics exist: Swiss banks". The Times of India. 13 September 2009. ^ "Banking secrecy spices up Indian elections". SWISSINFO – A member of Swiss Broadcasting Corporation. 14 May 2009. ^ "Education in India". World Bank. Retrieved 13 January 2011. ^ Economic Survey 2010, pp. 280–281. ^ "A special report on India: An elephant, not a tiger". The Economist. 11 December 2008. Retrieved 17 January 2011. ^ "India Country Overview 2013". World Bank. 2014. Retrieved 28 July 2014. ^ "Country Strategy for India (CAS) 2009–2012" (PDF). World Bank. Archived from the original (PDF) on 14 January 2009. Retrieved 21 June 2009. ^ Sachs, D. Jeffrey; Bajpai, Nirupam; Ramiah, Ananthi (2002). "Understanding Regional Economic Growth in India" (PDF). Working paper 88. Harvard University. Archived from the original (PDF) on 1 July 2007. ^ Kurian, N.J. "Regional disparities in india". Planning Commission of India. Retrieved 6 August 2005. ^ Dr.Priya Rawal (16 April 2015). Indian Stock Market and Investors Strategy. Dr.Priya Rawal. pp. 12–. ISBN 978-1-5053-5668-7. ^ "'Modi Mania' propels India's stock market into world's top 10". The Financial Times. 22 May 2014. ^ "BSE Ltd. (Bombay Stock Exchange) – Live Stock Market Updates for S&P BSE SENSEX, Stock Quotes & Corporate Information". www.BSEIndia.com. Retrieved 2 November 2017. ^ "Listing abroad sans domestic IPO set to be a reality soon". Business Standard. 28 July 2013. Datt, Ruddar; Sundharam, K.P.M. (2009). Indian Economy. New Delhi: S. Chand Group. p. 976. ISBN 978-81-219-0298-4. Drèze, John; Sen, Amartya (1996). India: Economic Development and Social Opportunity. Oxford University Press. p. 292. ISBN 978-0-19-564082-3. Kumar, Dharma (2005). The Cambridge Economic History of India, Volume II : c. 1757–2003. New Delhi: Orient Longman. p. 1115. ISBN 978-81-250-2710-2. Nehru, Jawaharlal (1946). The Discovery of India. Penguin Books. ISBN 0-14-303103-1. Panagariya, Arvind (2008). India: The Emerging Giant. Oxford University Press. p. 514. ISBN 978-0-19-531503-5. Raychaudhuri, Tapan; Habib, Irfan (2004). The Cambridge Economic History of India, Volume I : c. 1200 – c. 1750. New Delhi: Orient Longman. p. 543. ISBN 978-81-250-2709-6. Roy, Tirthankar (2006). The Economic History of India 1857–1947. Oxford University Press. p. 385. ISBN 978-0-19-568430-8. Alamgir, Jalal (2008). India's Open-Economy Policy. Routledge. ISBN 978-0-415-77684-4. Bharadwaj, Krishna (1991). "Regional differentiation in India". In Sathyamurthy, T.V (ed.). Industry & agriculture in India since independence. Oxford University Press. pp. 189–199. ISBN 0-19-564394-1. Bahl, R., Heredia-Ortiz, E., Martinez-Vazquez, J., & Rider, M. (2005). India: Fiscal Condition of the States, International Experience, and Options for Reform: Volume 1 (No. paper05141). International Center for Public Policy, Andrew Young School of Policy Studies, Georgia State University. "Economic reforms in India: Task force report" (PDF). University of Chicago. p. 32. Archived from the original (PDF) on 7 February 2009. "Economic Survey 2009–10". Ministry of Finance, Government of India. p. 294. "Growth of India". Archived from the original on 15 June 2013. Retrieved 10 August 2005. "Milton Friedman on the Nehru/Mahalanobis Plan". Retrieved 16 July 2005. "Infrastructure in India: Requirements and favourable climate for foreign investment". Archived from the original on 13 July 2005. Retrieved 14 August 2005. Bernardi, Luigi; Fraschini, Angela (2005). "Tax System And Tax Reforms in India". Working paper n. 51. Centre for Media Studies (2005). "India Corruption Study 2005: To Improve Governance Volume – I: Key Highlights" (PDF). Transparency International India. Archived from the original (PDF) on 26 March 2009. Retrieved 21 June 2009. Ghosh, Jayati. "Bank Nationalisation: The Record". Macroscan. Archived from the original on 23 October 2005. 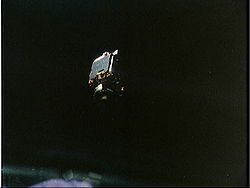 Retrieved 5 August 2005. Gordon, Jim; Gupta, Poonam (2003). "Understanding India's Services Revolution" (PDF). 12 November 2003. Retrieved 21 June 2009. Sachs, D. Jeffrey; Bajpai, Nirupam; Ramiah, Ananthi (2002). "Understanding Regional Economic Growth in India" (PDF). Working paper 88. Archived from the original (PDF) on 1 July 2007. Srinivasan, T.N. (2002). "Economic Reforms and Global Integration" (PDF). 17 January 2002. Archived from the original (PDF) on 26 March 2009. Retrieved 21 June 2009. Kurian, N.J. "Regional disparities in india". Retrieved 6 August 2005. Kaur, Ravinder (2012). "India Inc. and its Moral Discontent". Economic and Political Weekly. Kaur, Ravinder (2015). "Good Times, Brought to you by Brand Modi" (PDF). Ravi S Jha. "India, the Goliath, Falls with a Thud". Archived from the original on 9 May 2013. "India says 21 of 29 states to launch new tax". Daily Times. 25 March 2005. Archived from the original on 16 January 2009. "FinMin considers three single-brand retail FDI proposals". Archived from the original on 21 October 2012.